I'm not quite ready to join the hordes of mothers out there, but I have so many friends and family members that have already made that leap. So I've been to innumerable baby showers in the last decade and I love to give them a book, inscribed to the new baby, instead of a card (along with a present). Scholastic has compiled a list of the top 100 kids books. There are definitely some young adult books on the list, but there are loads of good choices for little kids too. Do you guys have a favorite kids book? 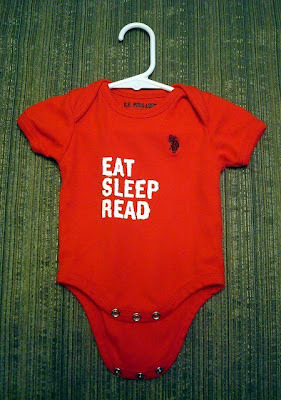 Check out Wallace's Bookish Baby Shower ideas here! p.s. Did you guys know there's a website where you can do a registry just for baby books for your shower? Check it out here at Usborne Books. Image from Book Riot post. Iknow, I have heard about these kinds of showers! And I am kicking myself for not doing something like that with mine. I do remember getting a book from a friend that told the story of the baby's birth, and was personalized. We still have that book! Love the idea of using an inscribed book in the place of a card!! I've made two short lists of my most highly recommended children's books for Estella's Revenge, and have a third one ready (for middle-school-age children) but they may have lost interest in posting lists over at ER and I'll have to post it myself. My most frequent gift for a second baby when there's a toddler sibling is Sandra Boynton's book and CD, Philadelphia Chickens. Good call Jeanne! Anything by Sandra Boynton is great! One of my favorite to read to my kids when they were babies was Off We Go! by Jane Yolen. I would use my fingers to travel up their arm like each animal in the book (tip toe like a mouse, slither like a snake, etc. )and they LOVED it. I like to give a classic for the baby and a parody for the older sibling. Like The Runaway Bunny by Margaret Wise Brown and The Runaway Mummy by Michael Rex. I also like the idea of a book instead of a card. My only fear would be giving a book that they already have and, since it's inscribed, they can't return it. I'm expecting my first baby and I really hope someone gives me a book at a shower! I have always wanted to get Boss Baby for my older sister, since their youngest child seemed to rule the house :) Definitely checking out that list. I'm done having kids, but I totally want to throw one for a friend. I love the idea of the book registry. Sandy - You can have one for your daughter in the future when she has kids! Kat - Isn't that great! I remember going to a shower years ago they requested a book instead of a card. Brilliant! Jeanne - I should add links to your Estella posts to this one! I love getting good kid book recommendations for my niece and nephews. Selah - I'll have to check those books out! I always worried about giving a repeat book, but I try to get creative and give a unique one. Melissa - I hope someone throws you one! Kristi - I do too! I still have a lot of my books from childhood, so a book registry is the perfect way to avoid repeats. Kara - Sheep in a Jeep, that sounds fantastic! So many! Don't really know where to start. Don't think it matters...I just need to start. I have that same shirt! 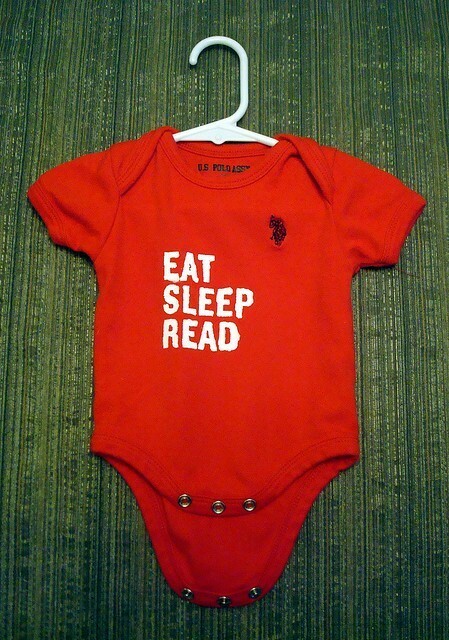 Well, as a t-shirt … not a onesie!